Gold is a conductive material already widely used as interconnects in electronic devices. As electronics have gotten smaller and more powerful, the semiconducting materials involved have also shrunk. However, computers have gotten about as small as they can with existing designs—to break the barrier, researchers dive into the physics underlying quantum computing and the unusual behaviors of gold in quantum mechanics. Researchers can convert gold into semiconducting quantum dots made of a single layer of atoms. Their energy gap, or bandgap, is formed by the quantum confinement—a quantum effect when materials behave like atoms as their sizes get so small approaching the molecular scale. 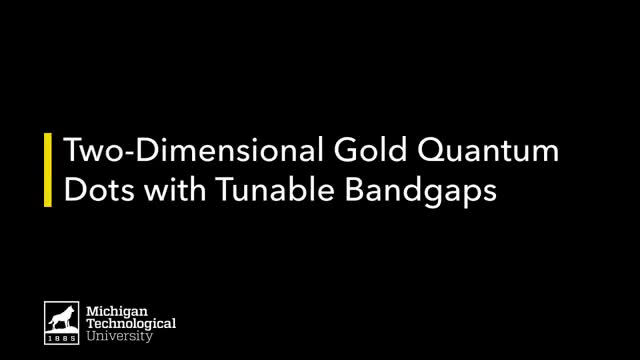 These 2-D gold quantum dots can be used for electronics with a bandgap that is tunable atom-by-atom. Yoke Khin Yap, professor of physics at Michigan Tech, led the study. He explains that the behavior his team observed—atomic-level manipulation of gold quantum dots—can be seen with a scanning transmission electron microscope (STEM). The STEM's high-powered beam of electrons enables researchers like Yap to watch atomic movement in real-time and the view reveals how gold atoms interact with the surface of boron nitride nanotubes. Basically, the gold atoms glide along the surface of the nanotubes and, they stabilize in a hover just above the hexagon honeycomb of the boron nitride nanotubes.